"Cold Mountain", another romantic epic helmed by Anthony Minghella (and based on what I assume is a best-seller by Charles Frazier) suffers from acute Oscar-bait syndrome. Against the backdrop of one of the bloodiest and most polarizing wars in the United States' history, it's almost unnerving how dead the entire film feels. "Cold Mountain", a misguided directorial effort by the normally sharp Anthony Minghella, passes on true profundity for bloated theatrics. In the midst of the American Civil War, Reverend Monroe (Donald Sutherland) moves with his daughter Ada (Nicole Kidman) to Cold Mountain, North Carolina, where he establishes a new church for the small town. During its construction, Ada meets one of townsfolk, Inman (Jude Law). The two flirt for a short amount of time and eventually fall in love. However, just when they find themselves in each other's arms, Inman has to leave to serve for the Confederacy in the war. After a series of horrific battles, Inman begins to question his involvement in the war. Realizing his true place is with Ada, he escapes from the poorly supplied Confederate hospital where he was being treated and begins to make his way back home on foot. Among the way, he meets a variety of interesting people who both aid and deter him on his quest. Meanwhile, back at Cold Mountain, Reverend Monroe has died, leaving Ada to take care of their farm. Being so unable to sustain herself that she is afraid of chickens, Ada receives the help of Ruby Thewes (Renee Zellweger), a spirited tomboy with experience in farming. While the two find some success in revitalizing the ranch, they are constantly subject to the terror of the local sheriff and his gang of thugs. At the core of the story of "Cold Mountain" is the chance for actual drama. For the first ten minutes or so, the film manages this through an artfully crafted battle sequence that offers some of the genuine agony of the war. It's all the more disheartening to realize, about an hour into the film, that this sequence does next to nothing to add any depth of context to the film as a whole. "Cold Mountain" whitewashes itself in a way that it overlooks what should have been embedded in its fabric; it instead opts for easier to swallow, more photogenic moments. It panders when it should challenge its audience to comprehend the breadth of suffering of an event like this. A good example of this type of missed opportunity is how quickly Minghella rushes through Ada's plight between the time of her father dying and Ruby's arrival. The film tells us, through narration, that Ada all but crumbles under the pressure of just trying to live. Unfortunately, we cannot understand her pain when we are merely given a snapshot of that time, a time when (apparently) Ada never even tousles her hair. What is in the film is decidedly uneven. The vignettes in which Inman comes across different individuals on his journey range from the poorly written (not even Phillip Seymour Hoffman can save a character so annoying that he feels the need to constantly discuss his bowel issues) to being the highlights of the film (Natalie Portman's struggling single mother is appropriately agonizing to watch). The performances are generally sub-par, with Law, Portman, and Brendan Gleeson being the only completely convincing actors in the cast. Nicole Kidman, above all, suffers from bad writing and a fake accent. Renee Zellwegger has one of the most interesting and complex roles in the film, but instead of respecting that character decides to chew the scenery and showboat her way through the film. 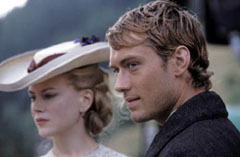 With "Cold Mountain", Anthony Minghella participated in a minor butchering of a yarn that could have used some improvement in the first place. It's clear that he's certainly capable of bringing out the complexities of a story and make believable its simplicities (see "The Talented Mr. Ripley"). Therefore, it's surprising to see him ultimately fail at this. It's also borderline insulting to watch a film that spoonfeeds its audience this kind of potboiler melodrama without trusting them to understand it. "Cold Mountain" is rated R for violence and sexuality.